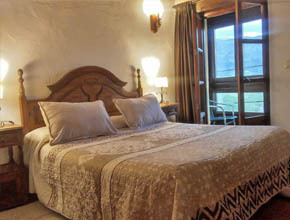 In Valleoscuru you can stay in one of our 10 themed rooms, 9 double rooms and 1 room that can accommodate one or two extra beds (ideal for families). 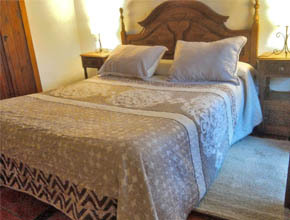 In all of them you can rest in facilities designed for your decline and all the comforts. 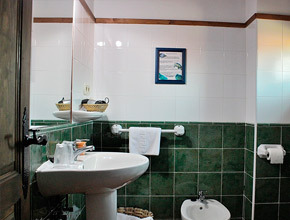 All rooms have bathroom, heating, television, telephone and some with their own terrace. With the names of the rooms we wanted to pay tribute to Asturian mythology taking the name of some of the most representative characters. 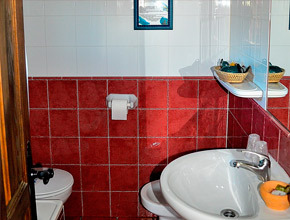 La Xana, El Trasgu, El Ventolin, El Nuberu, El Busgosu, La Guaxa, La Llavandera, El Papón, El Cuelebre, El Sumiciu, El Diañu Burlón. All of them related, with the four elements: air, earth, water and fire. 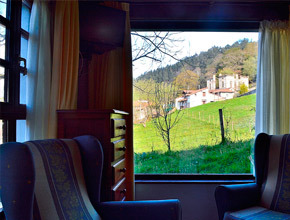 And very linked to the tradition of the Asturian people. 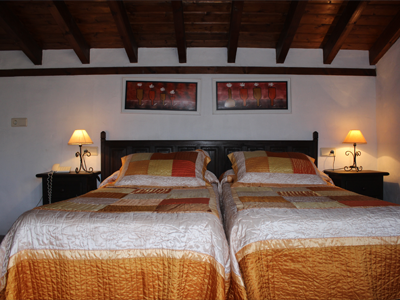 It is a room with a double bed, small but very comfortable, ideal for couples. 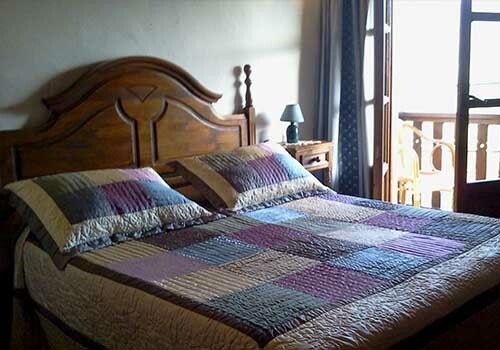 Very bright and with a balcony with breathtaking views from which you can see the whole village, the Valley and the Sierra del Cuera, itis located in the main building of the hotel. 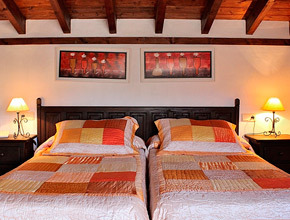 It is a large room, used mainly to house families of two adults and two small children. 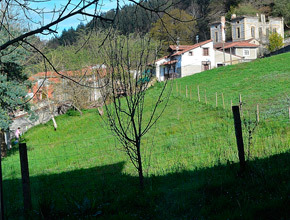 It is sunny since it has two windows from where you can see the whole village and the valley and attic, giving it a very cozy atmosphere. One of the nicest rooms in the hotel. 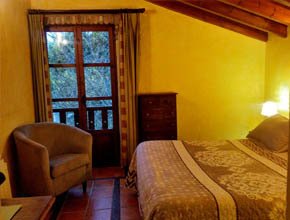 It has a large window that offers a great view of the village and the valley. 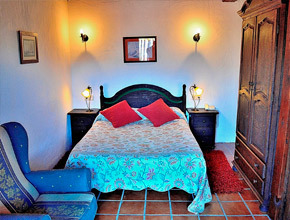 It is a room with a double bed and has two armchairs to read or enjoy the view. The best, the natural light that enters through their windows. 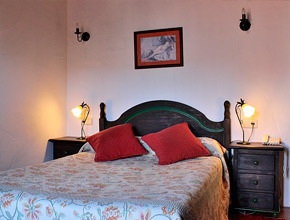 It is a double room, with an Asturian type corridor. Wood is the material that predominates in the room. 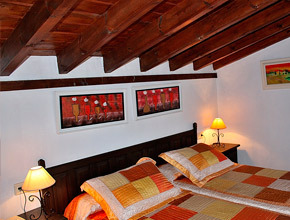 It has a very nice detail that is a very cozy loft with an extra bed for when a child comes. It is warm and bright. 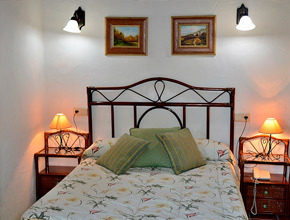 DO YOU WANT TO SEE MORE IMAGES OF THE ROOMS AND OTHER PARTS OF THE HOTEL?